Now that the BMMCC is shipping I'm curious how people are rigging it. It's very small, and seems best to keep it that way. So what are some good super light weight hand held configurations? Wooden Camera makes an excellent small cage for it, that adds the ability to attach a side handle and gives additional,support points to a tripod base plate. The biggest benefit for me from the Micro Cage, is if yiu use a Metabones PMPCC Speed Booster, which fits the Micro cameras, you can replace the Metabones foot with a WC replacement foot, that attaches to the Micro Cage and eliminates the alight rotational play in the MFT mount. 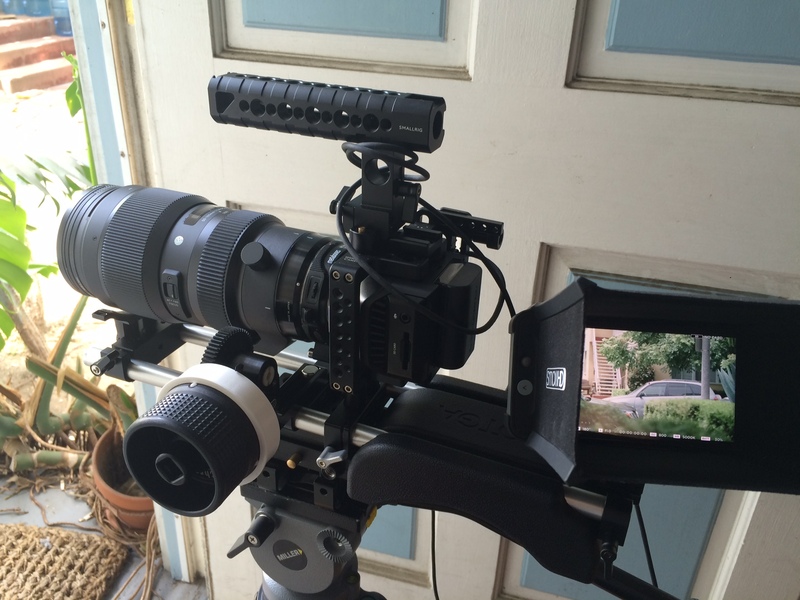 The WC BMPCC PL mount also fits the Micro Camera and cage. The Cage also gives a nice small mounting surface on the top to attach a monitor or EVF. Micro Studio camera with Wooden Camera Micro Cage. Denny, what is that ball mount you're using? I'm sick of articulating arms. Joshua Dredge wrote: Denny, what is that ball mount you're using? I'm sick of articulating arms. That's from wooden camera. I got one too but it ended out being a dud and ended out getting a noga one. It's chunkier but way sturdier. Thanks Denny. I really wish they had an Australian distributor. But going to have to get the micro cage anyway, so will throw that in the cart! No, the Ball head is not from WC, it came with my Zacuto EVF. Never used it with the EVF, but it works nicely with the VA. The Ball mount as 1/4 screw on one end and a shoe on the other. B&H also,sells a nice ball mount, about same size, with 1-4-inch screws on both ends, which would work nicely with the cage, and eliminate the shoe, but not as easy to mount. Mine arrived today. Got it working well like this. I saw the wooden camera cage. look nice. How much does it weigh? Denny, what are you feeding into the mic input? I can't rig it in anyway without it looking hilarious. My actual plan is just to put it on a cheap photo tripod and use it as a B cam with my URSA, though also using it shoulder rigged for an upcoming shoot. Benjamin, I do not know, weight specs not listed, but it weighs less than the pocket cage, and is very light, so it does not add any weight that you can feel, or would notice, the bits yiu add to it, weight more. The audio feed into the Micro Studio from the photo above, is the line out from my Sound Devices MixPre D, which is mounted to the tripod rossette via a magic arm. The Zacuto Ball mount on the VA, is actuall a Arca Swiss part. 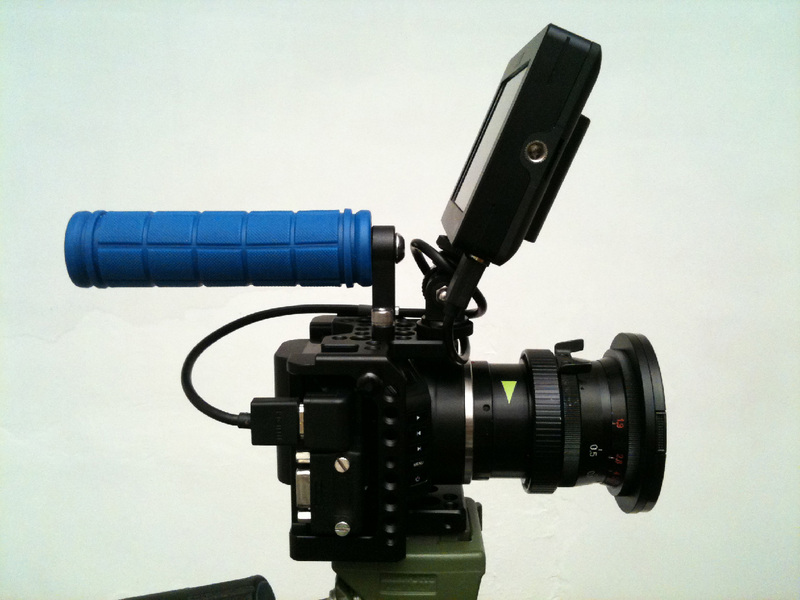 Denny Smith wrote: No, the Ball head is not from WC, it came with my Zacuto EVF. Never used it with the EVF, but it works nicely with the VA. The Ball mount as 1/4 screw on one end and a shoe on the other. B&H also,sells a nice ball mount, about same size, with 1-4-inch screws on both ends, which would work nicely with the cage, and eliminate the shoe, but not as easy to mount. Sorry Denny, it looks identical. My bad. Yea, they all look very similar to the same, I think everyone is coping the Arca Swiss ball mount, but the copies (I have one of those too) does not work as well. Last edited by Denny Smith on Wed Mar 23, 2016 3:57 pm, edited 1 time in total. I'm just keeping mine simple. Though still need to get an expansion cable with a shorter Lanc connection. Same with power. Also need to get a longer HDMI cable, or a coiled HDMI cable, since the one I have is too short. I got the Zigen .5m 2K/4K HDMI cable from B&H that has a locking HDMI connote or on each end, and features a low profile thin cable win a high bandwidwith for 4K. Got one for the Micro Studio and it works great with the Micro Cinema, and length is about right for a camera mounted monitor. Has anyone tried shoulder mounting this camera? Why shoulder mount? Camera is light and compact enough for a front grip setup. By,the time you,add a good shoulder rig, external batter to add weight to rear, like,the Zacuto Recoil, or the Wooden a Camera shoulder rig and LANC hand grip, with brackets, rail battery plate, etc, you could just buy a Ursa Mini 4K, with shoulder/hand grip and EVF, which is designed for shoulder mounting in the first place. The Micro camera is really too light to balance on the shoulder unless,yiu add a big zoom and heavy brick battery to counterbalance the heavy lens, then a nice way to mount it together on your shoulder. It can be done, but you,are,looking at an extra $2-3K worth of kit to do it. I would recommend getting a camera designed for shoulder mounting instead. ok, what about front grip for eye level? Better, there are a several good grips you can screw into the bottom, or if you have a cafe, like the Wooden Camera Micro cafe, yiu can had a side grip. I have a modified Graflex XL grip that will work for both spots. Also a setup,like Zacuto Sharpshooter or something similar will also work very well, and costs a lot less, used ones are often available thorough online auction sites. Last edited by Luca Iasevoli on Mon May 16, 2016 1:54 pm, edited 1 time in total. What Sun Shade is that? In addition to the LP-E6, I added a power line out from the monitor battery plate so as to be able to power both camera and monitor with one battery unit... (Thinking about a power brick instead of the Sony NP-F970...) As of now, the Sony battery can attach to a Dummy LP-E6. The theory is to tie the HDMI and power cables together... Should make "battery life" easier than having to manage multiple battery sources. In addition to the HDMI / Power lines, it's possible to output quick-cut buttons into or on the grip itself. For instance, why not add short-cut buttons for ISO, FPS, and menu display...etc? However, the grip itself sits close enough to the camera to be able to easily access the menu and control buttons. For now, there are small strips of gaff tape stuck on-top of one another, varying heights, to make it super easy to feel what button is what on the camera body. For example, the record button has a 1/4" of gaff tape on top. The playback button has about 1/8th. The up and down arrows have one small strip and the menu button has 1/8" of gaff tape on top... It makes it super easy to access the menu buttons without looking. Added a couple of custom function buttons on the inside/outside of a grip... Still pondering on what two controls to best put into place; ISO, Shutter Angle, White Balance... etc. Actually ran two more lines into the grip in case I decide to add to it later. For now, I can control both buttons with one finger. FYI: These two buttons cost a $1.50 at a local electronics store. put the new Sigma 50-100mm f/1.8 on the rig today. focus gear is coming from "helicopter sean" soon. Last edited by Dmitry Shijan on Thu Oct 26, 2017 12:22 pm, edited 3 times in total. Here is my bmmcc rig with a Sony CLM-V55 monitor and an Arriflex Schneider Cinegon 10mm. A fair bit of vignetting thought, needs to be cropped in post. How do you guys like this camera? Denny Smith wrote: Wooden Camera makes an excellent small cage for it, that adds the ability to attach a side handle and gives additional,support points to a tripod base plate. The biggest benefit for me from the Micro Cage, is if yiu use a Metabones PMPCC Speed Booster, which fits the Micro cameras, you can replace the Metabones foot with a WC replacement foot, that attaches to the Micro Cage and eliminates the alight rotational play in the MFT mount. The WC BMPCC PL mount also fits the Micro Camera and cage. Is that an Edelkrone follow focus? If yes, how well does it work? Yes it is Leon. The one shown in the photo is the older version, it had an issue in the drive gear, so,I returned it under a RMA and got the new improved version, which eliminates the troublesome reverse gear (for Nikon lenses) since I no longer have the Zeiss ZFs not an issue. The new version also has an improved gearbox, wich is adjustable for backlash, so zero backlash in this one. 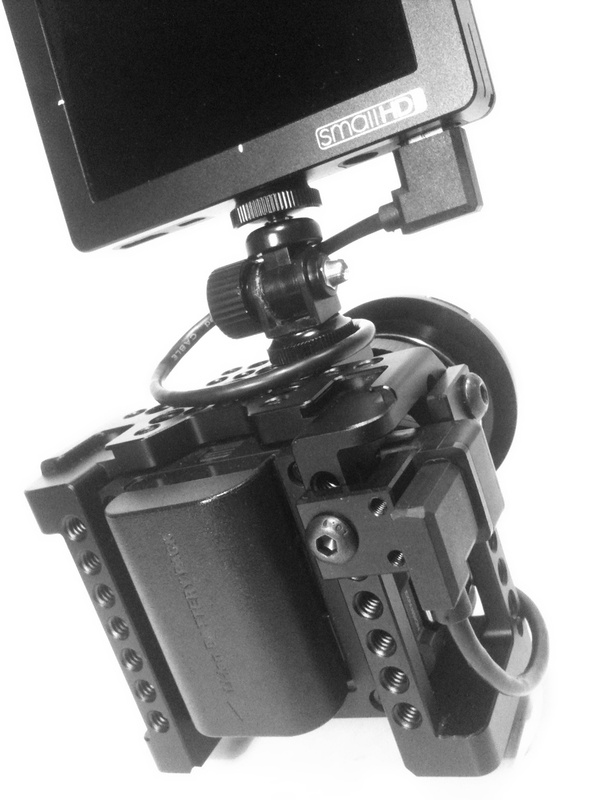 Also, you can get a matte box on with the mew one, will post an updated photo of the improved rig. Benjamin de Menil wrote: Mine arrived today. Got it working well like this. That is exactly what I am looking for! How do you find using it? Maybe a wooden camera handle to the right side and position the Zacuto lower on a ball mount so its more closer to the camera? And I would need a mic fitted, maybe to the left side? Here is my setup, I have been testing it for couple of days now and like it a lot. I was first thinking that having focus on potentiometer on this kind of setup is not useful as it easy to focus directly from the lens, but not so, it is much more steady to hold the system form the two handles and focus with the potentiometer. The Rode Video Micro, I am not sure yet, the levels are a bit low, but sound quality is anyway much better than with internal microphone. If anyone is interested, I have a Wooden Camera Micro cage, in new condition, available for $50. 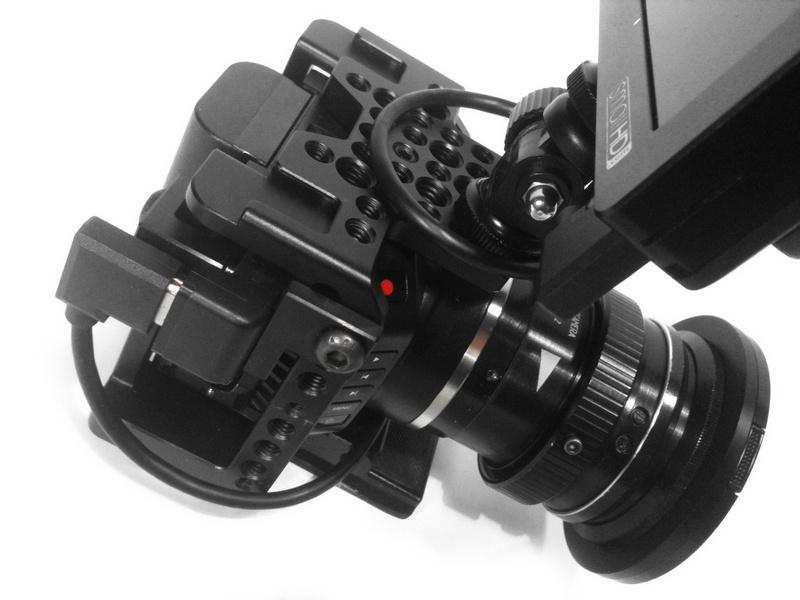 Just updated my BMMCC rig with factory machined Angle HDMI Clamp Lock kit and angle HDMI cable. Another idea for BMMCC mini-rig. Not so comfortable as DSLR but small enough to keep in hands, no need for shoulder rig. With lens image stabilizer and neck strap allows pretty stable video. Hand grip with controller inside, plus built-in power distribution: single battery for the camera and monitor.